With compliance deadlines on the horizon for many shipowners, the study revealed a critical need for owners to start their technology-selection process, and to resist buying BWM systems based on initial price alone. ABS has just completed its second comprehensive survey of the shipping industry’s progress towards global compliance with ballast-water regulations, finding just over a third of installed management systems (BWMS) to be fully operational. Conducted to form an accurate picture of the operation and installation challenges of achieving compliance, the survey included seven main types of ballast water management systems supplied by approximately 30 different vendors. Crews need to be trained as early and as thoroughly as possible to lessen dependence on the widely disparate levels of technical support being offered by the vendors. The findings should encourage shipowners to ensure that at least one company engineer is intimately involved in the systems installation process, with each system operated as much as possible before the compliance deadline to build corporate and crew familiarity. 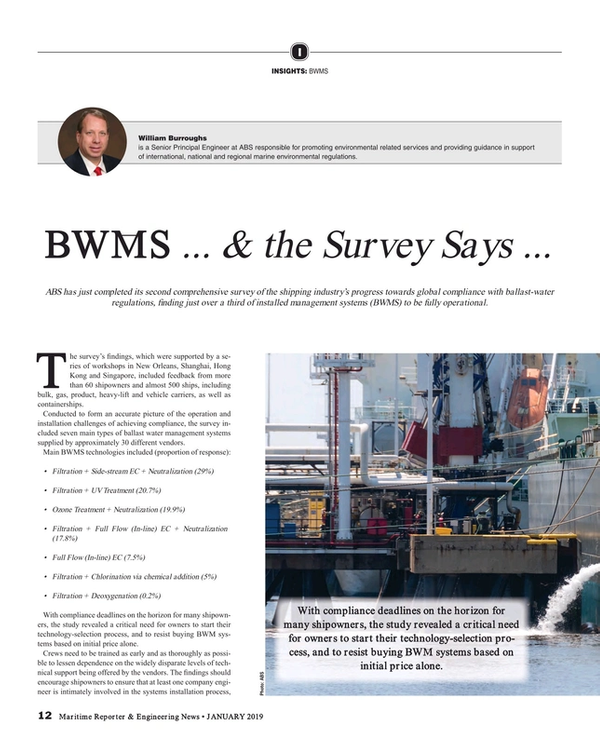 Results varied between BWM technologies, but the survey broadly revealed growing concerns among shipowners about: the operational reliability of the systems; operating expenses being as advertised; the availability of vendor support; quality of software; and adequate levels of crew training. In general, across all available technologies, about one third of participants claimed to be ‘happy’ with the reliability of the systems they had installed. The inverse implication of that measure is that system reliability remains a major concern for most owners. About 40% considered their system to be ‘user friendly’, which is a subjective evaluation; it is entirely possible that two owners could see the same treatment system from opposite sides of the spectrum. But the measure does speak to overall industry comfort with the systems offered. About two-thirds of respondents categorized their systems to be either ‘inoperable’ (6%) or ‘operationally problematic’ (59%). However, some of the under-performance ratings for what is essentially new technology may also be attributable to the skillsets of the crews being asked to operate the systems. Anecdotal evidence from the survey and workshop comments suggested that the highest levels of dissatisfaction came from owners whose personnel had received training on the fly during commissioning, while onboard acceptance testing was being conducted. During the workshops, ABS facilitators emphasized that best practices would include ensuring more comprehensive training regimes than could be received ad-hoc at the commissioning stage. As discussed above, best practices could include nominating someone from the fleet’s crew to attend the factory while the system is being built, returning an expert on the system that has been selected. Put into context, the world’s land-based water-treatment industry has historically required intensive training regimes and operator licensing, given the challenge of operating the relatively complex equipment. With that practice now moving offshore, the present commitment to training will need to significantly improve. More mariners will need to be trained at the academy level. Another area of concern identified by the survey was operational expenses (OPEX); just 22% of respondents said they were happy with the OPEX they were experiencing, suggesting it was above the estimates provided by the manufacturers. Expenses escalate if operational requirements or regulations require operators to reduce the treatment rates. The software used for the various treatment systems is dictated by the vendors, making most packages proprietary. Feedback from the survey indicates it is currently a significant barrier to operational reliability. As there is no standards body to currently offer guidance on design and quality, a lack of interoperability may remain a challenge beyond current deadlines for overall BWM industry compliance, which stretch into 2024. William Burroughs is a Senior Principal Engineer at ABS responsible for promoting environmental related services and providing guidance in support of international, national and regional marine environmental regulations. Bill’s previous experience includes Product Line Manager for the BALPURE BWMS manufactured by De Nora Water Technologies and serving as a Lieutenant in the United States Navy’s submarine force.